I’ve set out designing what I’d like to call ShiftTrix, a Arduino powered Marquee. 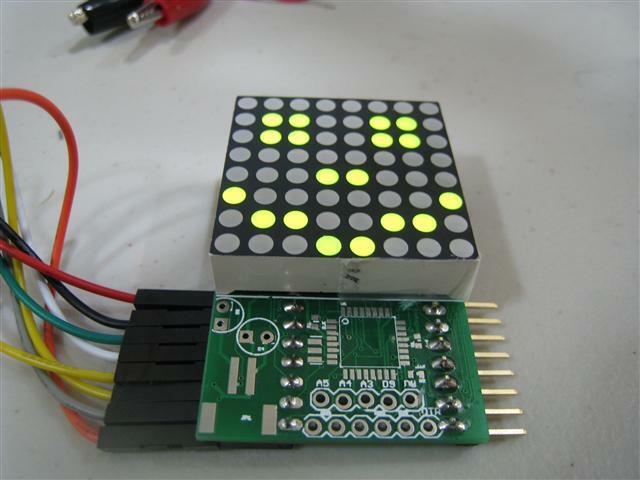 The idea is this, low cost LED matrix driver boards that are easy to work with at (hopefully) around $10 a board including the LED matrix itself. 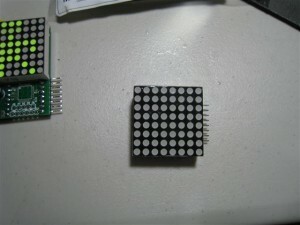 A similar serial driven LED matrix can go for $35 per 8×8 matrix. That can add up fast if you want to chain more then one together for a large display. Instead, my design is 1/3 the price, and can easily be chained together to create larger displays. The pictures in the post show version 1 with a red/green LED matrix. My goal was to have a single PCB design that can act as a ‘slave’ or as the ‘master’. 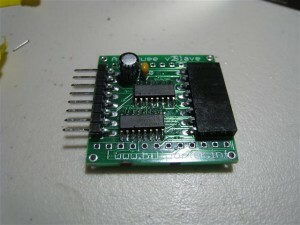 The master is the board with an Atmega 328 that drives all the boards in the chain. 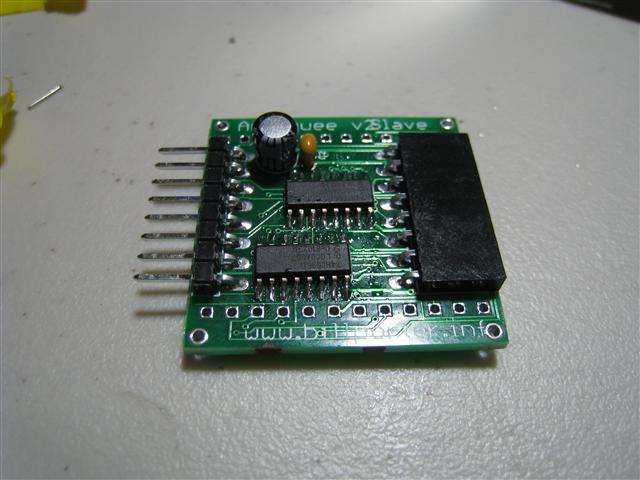 The master also has a 5V 2A voltage regulator circuit to power the entire chain. As you can see in the pictures, I have version 1 running with an Arduino Duemilanove standing in as the master. I’ve started redesigning for version 2, and I think I’m going to stray away from a single design PCB, so that the board size can shrink to fit it all behind the LED matrix. But this may drive up the price point. My plans are to open source that hardware design when I’m done, and maybe even selling kits to build your own. I’d like community input for what you would like to see in a product like this, and if the price point is right. Please feel free to leave comments. Version 2 of the design is in, biggest change is everything fits behind matrix now, no more board sticking out. Pictures of that soon. New photos of a V2 slave board. Notice it all fits behind the matrix now. Not sure I like the cap sticking out the back, but I don’t know what else to do with it. Great project! 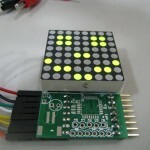 Are you using the 3mm LED matrix modules? Hard to tell from our pictures what the actual size is. Any progress on the project and releasing the design? Yes I am using the 3mm LED matrix. The modules you see displaying my power usage is my final design. As soon as the holidays are over I’m going to works towards getting ready for release. If you are interested in some help to make this an offering for sale, let me know. 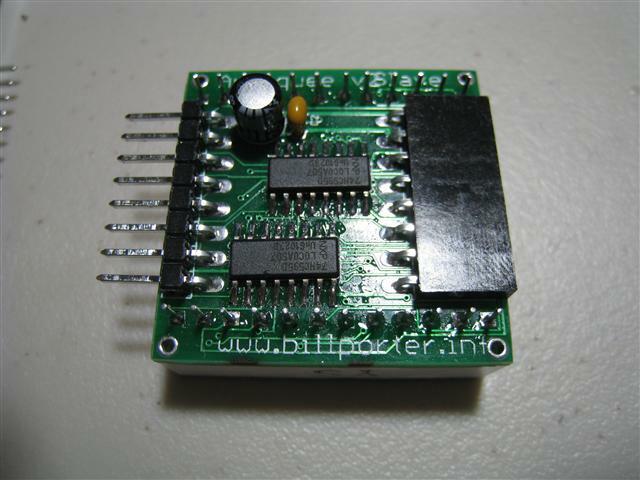 I have a small electronics website and contacts overseas to acquire both the LED modules and PCBs fairly cheap. This looks very kewl. I recently bought 4 bi color led matrixes and searched around for implementations on my arduino. This one looks very nice and I am very interested in the specifics of your solution. I read that using a max7221 can result in some strange behavior (leds staying on). Does your solution have similair problems? No strange problems here. I’m not using specialized chips like the max7221, just shift registers and the display is driven by the Arduino like a TV screen. 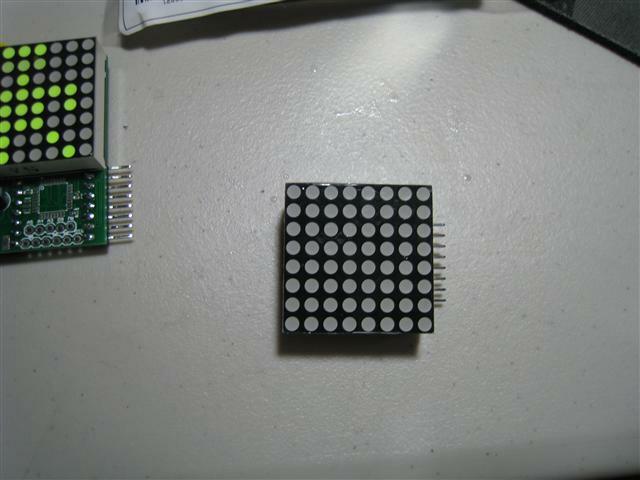 This mean each complete slave module is only about $12~15 including the LED matrix itself. I think the max7221 is $10 alone. I’m not quite ready to release specifics, but hope to have a kit out shortly. Hi Bill, this is a really cool looking project. I am interested in a kit when they become available. Thanks! Cool. Low cost, and a nice form factor. I am testing a bus oriented matrix design like yours but using 5×7 modules laid on the side to make a 5 pixel high marquee. Hiding all the driving electronics behind of course. I’d love to make it modular like yours but just fitting everything (on protoboard) behind the tiny matrix I have enough challenges. It’s amazing how much space the connectors take up on the PCB in your photos and the extra lines for bicolor and resistors. Did you ever develop this to the point where people can buy them? 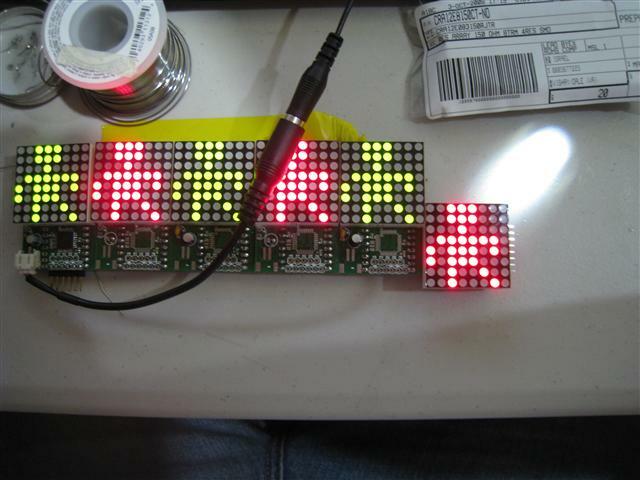 I’d love to get my hands on some, either as fully assembled units or as PCBs I can add the displays to. No, I’ve been delayed, mostly by projects at work and getting the childrens science show going (see my latest blog posts). I have finalized the design and I have everything for a handful of kits, but it’s 100% assembly required. How good are you at soldering surface mount? Nick, if your interested, I’ll send you a free slave kit (requires an Arduino or other uC) to try out. I plan on making build instruction videos and would want feedback on how well it worked out for you, and what “difficulty” you found it to be to solder together. If you are interested, email me at the address on the bottom of the page. 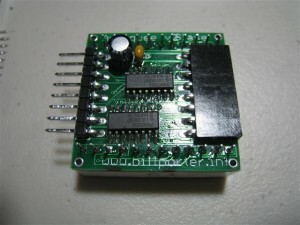 I pulled the bitmap from an Arduino forum post. I’ll have to see if I saved it’s location. There’s also a excel sheet on the internet that generates the bitmaps for frames you create yourself. I found it all through google, but if you still have trouble, I’ll look for it this weekend. This looks like a great product–I especially like the price point. Let me know if you are looking for folks to try out the slave kit. I’d like to buy a board when you have some put together. I already have the matrix itself. I’m not up for soldering SMD. Hi Bill. 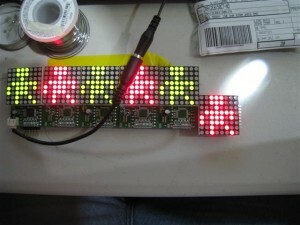 Found you from Sparkfun’s product page for the LED 2-color matrix. A couple friends and myself are working on an arduino-powered tamagotchi-esque toy that uses one of these 8×8 LED displays. 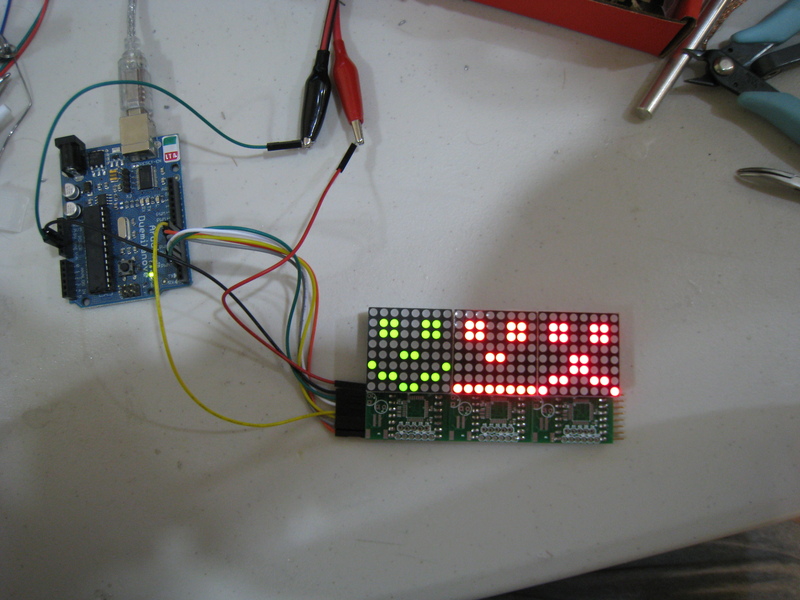 Our prototype uses MAX7219 to drive the display, but we decided that would be cost-prohibitive for the next revision. Then we realized that our eBay displays were common-anode instead of common-cathode for the two colors. So the next design will probably involve a counter/divider for the rows, with one shift register for each column color. Can you advise which parts you chose for operating voltage and current? I’ve been trying to follow the footsteps of others who have used the 74HC595, but there are reports that it simply cannot support the current as it is a mere logic device. Great. I am planning to develop live LED based screen that shows live stream from camera. Would like to explore this as to how fast the matrices can be refreshed, and if they all can be synced properly so as to not have and aliasing effect. The frames will be available on the PC from which they will have to transferred to arduino frame buffers regularly. Great project! 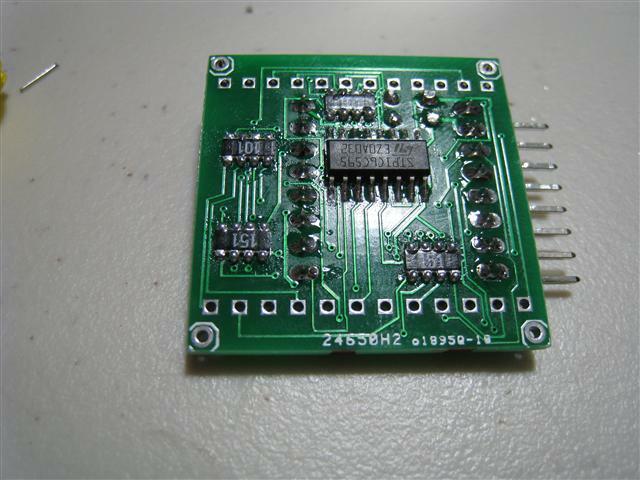 Do you have a couple of kits for sale (I’m a fairly good aT soldering smd)?